Wow... I can't believe we are already at the last day of 2007! Between selling a house, buying a house and moving back to Minnesota from the east coast, this year seemed to pass in the blink of an eye! We're both excited to see what 2008 brings into our lives! We typically stay in on New Year's Eve, so I asked Jeff a few days ago what he would like to do for dinner. After thinking about it, he told me he didn't want anything special and said "let's just have a plate of snack-y type stuff". That could mean anything... so I asked for something more a little more specific - he rattled off some stuff and we got everything bought at the market yesterday. 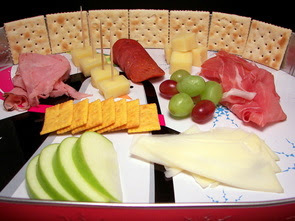 What we ended up with was a plate to share of thinly sliced prosciutto, sliced ham, rounds of pepperoni, slices of sharp white cheddar, shaved Asiago, cubes of Jarlsberg, juicy green and red grapes, Granny Smith apples, cheddar crackers and of course, he had to have some good ol' saltines! We should be all set and ready to watch the ball drop with very fully bellies! That is, if we even make it to midnight - I think it has been a few years since since we actually stayed awake long enough to see it happen! We've been asked quite a few times if we would post a round-up of our favorite recipes of the year. Jeff and I both thought about it and decided to make separate lists, then mash them together and see what we came up with. We picked a total of 12 sweet and 12 savory (just because there are 12 months in a year... at least that is our excuse!) - however, this was very difficult as we both had recipes on our lists that didn't match the other. Oh well - I could have probably picked at least 20 or 30, but we will stick with 12 and go with that. Just keep in mind that we had many other favorites - here's our list in alphabetical order. If you will be out and about tonight, have a great time and please be safe! Only 7 new recipes for us this past busy week - our favorites were the Apricot Poppy Chicken with Dill Potatoes, Pepperoni Bread and the Chocolate Crunch granola recipe. 2008 is right around the corner - can you believe it? It seems like this year has just flown by! I'm excited to see what the new year brings! Between getting groceries today, starting to take down the holiday decorations and just general clean up, I did not feel like doing a lot of prep to get dinner on the table. I had another recipe in mind for dinner tonight, but decided to make this Flank Steak and Vegetable Stir-Fry I had set aside for later in the week. While there was some slicing that needed to be done, it really took very little effort. We used flank steak for the protein portion of this dish, but you could just as easily use sirloin if you wanted. To make slicing the steak into thin strips a little easier, stick it in the freezer for about 15 or 20 minutes. This won't make it rock solid, but it will firm the meat up just enough to get thin slices easily. Besides your regulation salt and fresh ground pepper, the steak is taken a slightly different route, flavor-wise, with a sprinkling of five-spice powder. 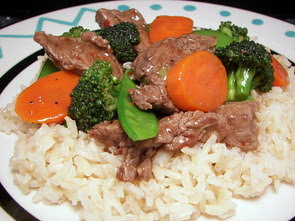 Thinly sliced carrots are first to hit the hot skillet, followed by the sliced steak and broccoli florets. The sauce, a combination of beef broth, soy sauce, crushed red pepper, a dash of sugar and cornstarch to thicken, is added next, followed by crisp snow peas. Within 5 or 6 minutes after the carrots hit the pan, dinner was finished - we served ours over a bed of nutty brown basmati rice. Tender beef, vibrant vegetables and a tasty sauce all wrapped up in no time - what more could you ask for? We've been quite fond of that Peanut Butter Granola we first made a few months ago - I can't even remember how many times we have made it now. We still haven't gotten tired of it, but we thought we should at least try out a few other recipes we've been collecting along the way. Since it used pantry staples, I was able to get this recipe for Chocolate Crunch in the oven pretty quickly this morning. In additional to the normal rolled oats you would find in most granola recipes, this one also includes Cheerios (well, that it what I used anyway, it originally called for Rice Krispies), brown sugar, slivered almonds, salt and a bit of cinnamon. Adding sweetness and moisture to the dry ingredients is honey, a little canola oil, vanilla and a couple ounces of melted bittersweet chocolate. 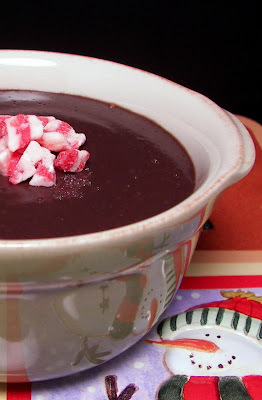 The chocolate is really what drew me to this recipe as we've never tried one that included it. These ingredients get fairly thick when mixed together, so you'll need to roll up your sleeves, get down and dirty and use your hands to get everything thoroughly combined. 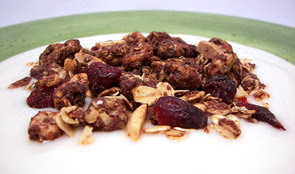 For a little contrast in texture, a few chewy dried cranberries are tossed into the fully baked granola. This won't produce a "clumpy" granola as there is not much fat in it, but nonetheless it was quite good and the chocolate really brought a tasty different dimension. Try it in a parfait of fresh berries and yogurt, over a couple scoops of ice cream or just snack on it right out of the container as we ended up doing this afternoon after we tested it out over some vanilla yogurt! I needed to get some carrots used that had been lounging around in the refrigerator - so we made these Maple-Tangerine Carrot Coins to have along side of tonight's dinner. You don't have to make a trip to the store if you have everything on hand except for the fresh tangerines - oranges would work just as well, but the tangerines do add a special note if you pick some up. 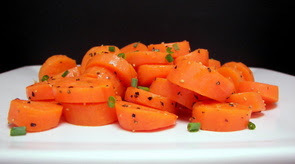 The carrots are sliced thinly enough so they don't take too long to cook, but thick enough so they still have a slight bite to them. They are cooked in a mixture of the fresh tangy juice, broth, sweet pure maple syrup, a dash of cinnamon and a touch of butter for flavor. After a couple minutes of cooking them covered, the lid is then removed so the liquids have a chance to reduce and create a thin glaze to coat the carrots. Sweet and tender, yet not mushy, these gleaming coins made for an excellent and quick side. One of the vegetables in tonight's recipe for Teriyaki Pork and Vegetables with Whole Wheat Noodles was suppose to be mushrooms, however, since they would have been quite visible in this dish, I decided I might as well replace them with broccoli as Jeff would have thumbed his nose at it. Now, you know he has eaten mushrooms more than a few times now, but it was only because he couldn't see them! It is not that big of a deal though - I'm just happy that we have both really expanded our list of foods we now eat since starting this site... we've come a long way from chicken tenders and pizza! While you wait for some whole wheat spaghetti to cook, nutty toasted sesame oil is first heated in a large skillet. Chopped red bell peppers, along with the white part of a few green onions, thinly sliced pork and broccoli florets are added to the hot oil - this will quickly cook the sliced pork and allow the vegetables to become crisp-tender. 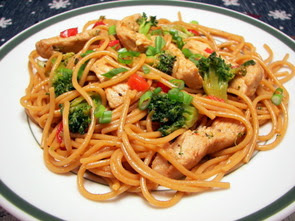 Salty teriyaki sauce, a little of the pasta cooking water and chili garlic sauce are tossed in, along with the cooked pasta, into the skillet. With a robust flavor from the sesame oil, the dish is complimented well by the slightly sweet, yet savory teriyaki. The chili garlic sauce added a nice kick without being too spicy - if you wanted to use the mushrooms as originally called for, you'll need about 3 1/2 ounces worth of sliced shiitake mushrooms. I'm not sure what to say about tonight's dinner. 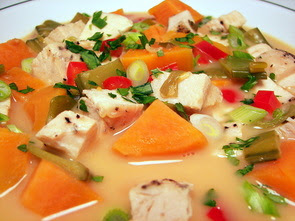 It's not that the Thai Chicken Chowder we made was awful or anything... however, it was just ok. The flavor combination either seemed off to us or it was missing something that would bring it together. I pretty much made the recipe as written, except I left out the celery (it called for a chopped cup) as it just didn't seem to go with the rest of the ingredients. This could have certainly been a wrong move, but I don't really think it would have helped much. I also did not care for how well done the snow peas ended up - a little to soft for both of our tastes. That being said, I do think that this chowder had a couple things going for it. We liked the chunky cubes of sweet potatoes - they added a hearty element, along with chopped cooked chicken, to make this lighter dish a bit more filling. We also enjoyed the flavors from the fresh lemon grass, ginger and lime juice. The heat from the teaspoon of chili garlic sauce was pleasant as it was slightly toned down by the cool coconut milk. While it has promise, I'm not sure what I would do differently so that we would have liked it better - so, unfortunately I doubt I would make this again for us. I mentioned on Monday that we were busy making a couple treats to take down to the farm on Christmas Day. The drive down was nice - however, the drive back last night did not go as planned! We first hit freezing rain and then came heavy snow along with very slow traffic - the usual hour or so drive took almost 2 1/2 hours! The weather report told us to expect a few flurries, but we were quite surprised when we woke up this morning to find about 7 or 8 inches of new snow on the ground! We thought we would start off with a couple snaps from the farm! 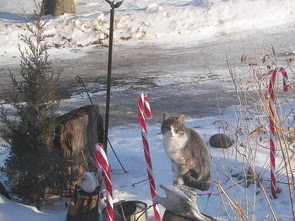 Of course, there has to be a few farm cats... but this was the only one that stood still long enough to capture her dozing off on her stool. We couldn't forget to take a picture of Max's daddy! Like father like son eh? 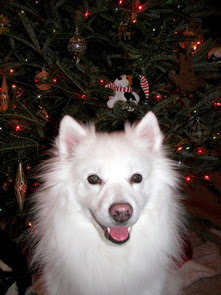 Just as fluffy and little (ok, a lot) more rambunctious! Anyway... back to the food! 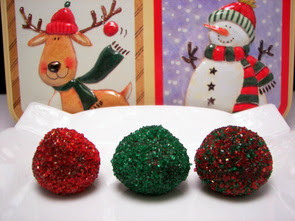 One of the treats we took down was a batch of Dark Chocolate Truffles! 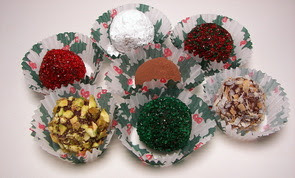 These are just a simple combination of hot cream and bittersweet chocolate that is cooled down until you can roll the mixture into balls. 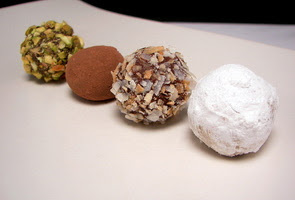 Rather than dip the truffles in chocolate, we decided to take the easy route and roll the rich balls in a variety of coatings. We ended up using cocoa powder, confectioners' sugar, toasted coconut, chopped toasted pistachios and a few sparkly sugars. Smooth, creamy and oh so decadent - this was definitely one of Jeff's favorites! We also made a couple loaves of Pepperoni Bread! I haven't made this for a few years (I think the last time I did make it was before I really was interested in cooking). Jeff said his mom used to make this for him all the time growing up, but we took the recipe and decided to update it a bit. Rather than using frozen bread dough, which most recipes out there call for, we decided to make a very soft, tender and fluffy basic white bread. You know, the kind that would make for a killer PB&J sandwich! What gives this bread such a great texture is the additions of dry milk and potato flakes to the dough - a few tablespoons of butter didn't hurt either! Once kneaded and risen, the dough is punched down and set aside to rest for a few minutes - this will make it very easy to stretch into a large rectangle. Jeff's said his mom would only put pepperoni in her version (which is perfectly acceptable!) - however, we added a couple more layers of flavor. We started out by first sprinkling Italian seasonings over the dough. Next, we tossed on a few handfuls of mozzarella and Parmesan cheeses on top, followed by rows and rows of sliced pepperoni. When you roll the dough up into a log, be sure to seal the seam and ends well - also try to tuck the ends under the large roll so it stays closed. 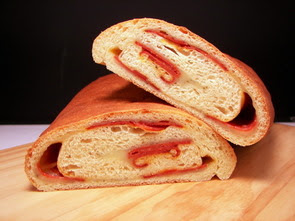 Very good cold, this bread is especially delicious while still a little warm and the cheese is gooey - enjoy it plain or have some marinara sauce on the side for dunking. Be sure to give it a good 15 to 20 minute rest before you cut into it though as the insides will be very hot! If you don't feel like pepperoni bread, at least do yourself a favor and try the basic bread - so good! The dough recipe makes about a 1 pound loaf and would be best baked in a 8 1/2" by 4 1/2" loaf pan if that strikes your fancy. 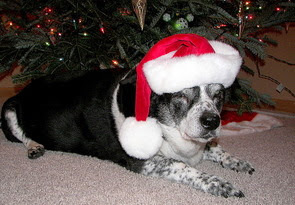 Spike and Max wanted to send their wishes as well - since Spike has seniority (he's 18! 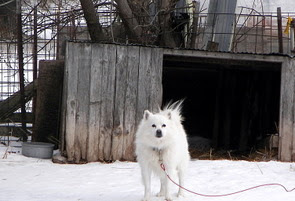 ), he thought it was only fair to let him go first. Doesn't he look thrilled to get his picture taken? Spike wanted to just take it easy today and lounge around as you can see, but Max was being fussy and didn't want his picture taken until he had his Christmas bath. Hee hee! 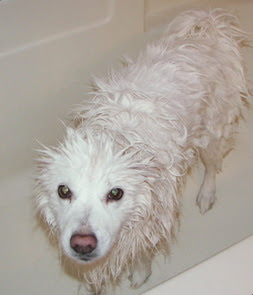 He is so tiny when he gets wet, but his hair poofs out back to normal after a few minutes with a hair dryer! Jeff insists that we open our gifts on Christmas Eve, so we're off to go drive around the neighborhood to gander at the lights and then come home to do that! We'll be back on track with our daily updates on Wednesday. It's hard to remember just how much stuff we ended up doing this past week or so - it all seems to blur together when I try to think back after getting all the treats baked and sent out. I still can't believe just how much stuff we ended up making! Though, Jeff is a little sad as yesterday we ran out of anything we had leftover! I reminded him that just means it clears the way to make new goodies again! I don't know what we were thinking, but we still did our weekly trip to the market this morning - what a zoo! Thankfully we were out early enough that we missed most of the rush. I just know that there is no way I am going to go out on Monday if we needed anything, so it's just as well we did it today. While we were out, we picked up some fresh dill and potatoes so we could make tonight's Apricot Poppy Chicken with Dill Potatoes dish for dinner. While some halved small potatoes are boiling away in salted water, chunks of chicken are added to a heated skillet to brown all over. Shallots are added and when softened, a dose of apple cider vinegar is tossed in. 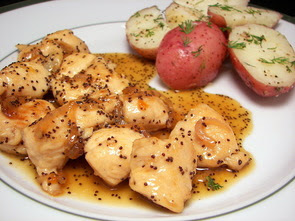 Chicken broth, sweet apricot preserves, honey and poppy seeds are stirred in and the mixture bubbles away until the chicken has cooked through and the potatoes are ready. Right before serving, the generous sauce is given a glossy shine by adding a knob of butter. The potatoes, which are tender, yet still hold their shape well, are drained and tossed with a couple pats of butter for richness and seasoned with salt and fresh ground black pepper. Since dill loses a good amount of flavor when it is heated, the fresh herb is one of the last ingredients to be added to the potatoes. The chicken, dotted with those crunchy purple seeds, was pretty sweet from the preserves and honey, but the vinegar and other savory ingredients made sure it didn't feel like you were eating candy. We liked that this was pretty much a complete meal as is, but if you don't feel like potatoes if you make this, there was plenty of sauce to go around where you could probably serve this over some fragrant brown basmati or jasmine rice instead. Last year we talked about those new peppermint baking chips that we had picked up at one of the markets back in Maryland - the first thing we tried them in were those thin and crispy chocolate cookies. We came across them again out here in Minneapolis, so we had to pick up a couple more bags to experiment with! 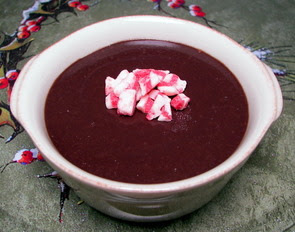 Since we already used them in some cookies, we went a different route and turned a basic chocolate pudding into a Chocolate-Peppermint Pudding for a snack today! This cooked pudding starts out by combining sugar, cornstarch, cocoa powder and salt. For a smoother flavor, I prefer to use Dutch-processed cocoa powder, but if you like the edge that the natural has, feel free to use it. A combination of milk and evaporated milk (using this duo gives the pudding a great mouth-feel without the need to use heavy cream) are whisked in and the mixture is brought to a boil. To prevent the bottom from scorching, be sure to be whisking constantly while you wait for it to bubble. Once you see the mixture thicken, the original recipe calls for a couple ounces of chopped bittersweet chocolate to be stirred in off heat - this is where we swapped in those peppermint chips. To make serving easier, we portioned the pudding off into individual cups before refrigerating - I don't care much for the skin that can form as they chill, so I covered the surface of my pudding cups with plastic wrap. Jeff on the other hand loves that, so we left the plastic off of his portions. Texture-wise this pudding was very good - velvety smooth and thick. The flavor? If you love chocolate and peppermint as much as we do, then you won't be disappointed! The peppermint was not so strong that it muddled the deep chocolate flavor, yet it was not too mild either - just minty enough for us. 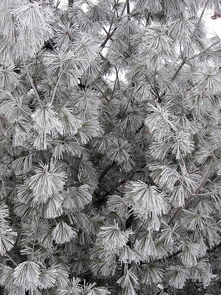 The weather has been weirdly foggy and dreary these past couple of days - even though it has not snowed in a few days, the trees have had this glistening white coating as the temperature has been hovering right around 32 degrees and the dampness has been freezing on them. When it is like this outside, we end up craving something that is warm and comforting... just like that baked macaroni dish we had last night. Tonight we opted to go a different route and we made some dinner rolls and a soup! 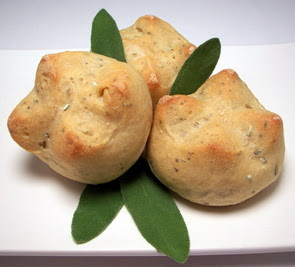 I thought about making our favorite Roasted Garlic and Fresh Rosemary Cloverleaf Rolls, but we decided to throw together a new recipe and bake some Sage Dinner Rolls instead. The dough for the rolls was easy to work with, not too sticky and it got bonus points for including some whole wheat flour. I used instant yeast, but you can use active dry if desired - just mix the warm water, honey and yeast together and let it sit for a few minutes. Then, add this mixture, along with the oil, to the dry ingredients and proceed as directed. For a more savory aspect, the dough is given the addition of fresh minced sage - however, I imagine rosemary would work just as well if you prefer that flavor. To give these rolls some room to grow and add some visual interest, an X is cut into them with a pair of shears (or a sharp knife!) before the second rise. 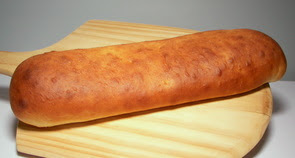 The dough puffs up well when baked and you are left with a substantial, yet tender and light golden roll. 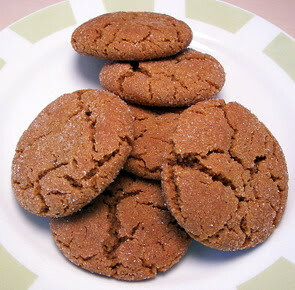 The whole wheat flour didn't weigh them down at all and added just a very light nutty flavor. The Vegetable Noodle Soup we made to have with the rolls did have few things that needed to be prepped first, but the soup didn't take too long to cook and was not lacking at all in the flavor department. In just a couple tablespoons of oil, diced onions, celery and a few sliced carrots are cooked until they just begin to soften. Minced garlic and chopped thyme are then added and cook just until you begin to smell their fragrant aromas. Broth, a little water and a bay leaf follow and the soup simmers away until the vegetables are tender. As is, the soup is pretty light and tasty - however, the recipe throws in a couple handfuls of alphabet pasta to bulk it up and of course, add some fun to the dish (and no, I was not the one who was too busy to enjoy the soup... someone was caught up in trying to spell his name with the noodles on a spoon!). When the pasta is done, the heat is turned off and some green peas and chives are tossed in to warm up. You could toss some shredded chicken in if you feel the need to have meat, but we did find it filling enough with the pasta. There are many ways that one can make good ol' macaroni and cheese - we've made quite a few ourselves, be it via a stove-top method or baked in the oven. 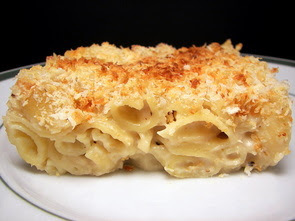 Tonight's dish for dinner, Macaroni and Three Cheeses, is made using the latter and the good news is you can get all of the prep work done ahead of time! I knew we were going to be busy out and about running errands today, so I prepared the dish before we left this morning and stashed it away, fully assembled, in the refrigerator. When we got home, all I needed to do was get the oven hot and bake it while we were putting stuff away and dealing with the pups! The three cheeses in this recipe are sharp white cheddar, Havarti and Muenster - you could also use others if you can't find these or just don't like them. Try using mozzarella, Monterey Jack or even fontina for any of the above. As you wait for the shells for this dish to cook (be sure to under-cook the pasta slightly - about 2 minutes before al dente), the white sauce is made - to boost up the flavor, dry mustard, along with a pinch of fresh grated nutmeg, are added when you add the flour to melted butter. Nutmeg may seem like an unusual addition to some, but it just seems to bring out all the flavors in a white sauce - don't forget to add that pinch! Once milk has been whisked in and the sauce thickens, hearty handfuls of the cheeses are gradually added off heat until it is very creamy. For added depth, a couple dashes of Worcestershire sauce is also stirred in. After the pasta and sauce are combined, they are poured into the baking dish and topped with a generous dose of panko breadcrumbs that were mixed with melted butter. The original recipe called for fresh breadcrumbs (which you could certainly do - you'll need about 4-6 slices worth), but we love the crunch that panko brings. At this point, you can either bake it right away, or you can cover it well and place it in the refrigerator for up to a day. If you do chill it, be sure to add about 15 more minutes or so to the total baking time. We loved the combination of all those cheeses - mixed together, they brought a rich (yet not coma inducing), sharp and buttery flavor. To get neat slices when you are serving, try to let it sit for about 10 minutes once it comes out of the oven. While it is not swimming in sauce like some recipes, it is still pretty moist and creamy, which was a nice textural contrast to the crunch of the golden panko on top. Adding yet another new food... this time it was Persimmons! Have you ever eaten one of these? We've never tried them, until tonight that is! 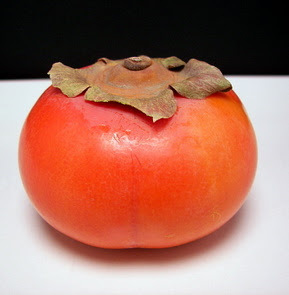 This is a Fuyu persimmon - there seems to be two common types, this one is round and looks more like a tomato. It is firm when ripe and is non-astringent, unlike the Hachiya version, which is more heart-shaped and needs to be quite soft to use. The Hachiya has high levels of tannins that are slowly removed as it ripens making it viable to eat (and actually enjoy!). A quick tip - if you do want to use a Hachiya in a recipe that calls for one, but yours is not quite ripe enough, you can freeze the fruit until solid. Then, just thaw the persimmon and when it is soft, it will be sweeter and less astringent. 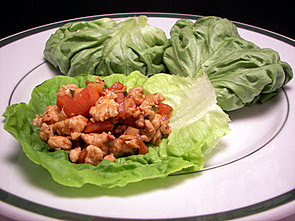 Let's get back to the lovely Fuyu's - we used a couple of them tonight to make these Chinese Chicken and Persimmon Lettuce Wraps. Lean ground chicken is browned and crumbled along with a couple teaspoons of cornstarch and minced green onions. The sweet chunks of the Fuyu are added, along with crisp water chestnuts, fresh ginger, soy sauce, orange juice and a shot of oyster sauce. We've used oyster sauce in the past, but I made the mistake of letting Jeff see me add it when I was making this! His first comment was "Ugh, why are you putting liquid oysters in our dinner??!". I think he was afraid it was going to add a strong fishy taste, but once I let him know what it was, that this was not the first time I used it and assured him it just added a good depth, he begrudgingly changed his tune and said he would at least try it. 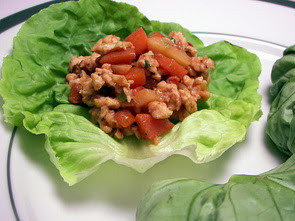 To keep the dish somewhat light, we served the mixture piled onto tender Boston lettuce leaves and rolled them up like a wrap - you could use a regular tortilla if you wanted, but this way the full flavor of the filling was able to shine through. The chunky persimmons softened slightly, but still had a nice texture to them - they brought a sweet element that played off the saltiness in the soy and oyster sauces. If you use a little smaller lettuce leaf, we thought that these would be great as a one or two bite appetizer as well! We are slowly getting back into our regular routine around here now that the big baking event has passed. We had so much fun getting everything prepared and packaged up, but it tends to get a little stressful during the last couple of days. I think we made better use of the freezer space this year so a few of the things didn't have to be made last minute. Instead of taking a few days off from cooking (which I probably should have done! 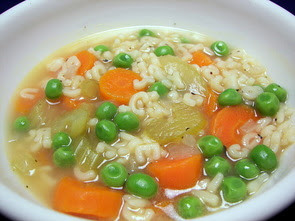 ), I decided to make a more time consuming recipe for dinner tonight. We've pretty much relied on recipes that could be made in a hurry during the last week or so. 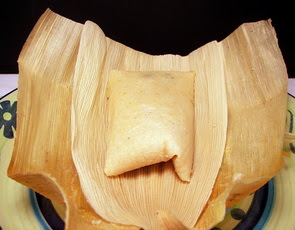 When we lived in Phoenix, we were lucky enough to get some fantastic homemade tamales from one of our neighbors. We kept meaning to try and make some ourselves - it's always seemed a little daunting though. However, after we attempted these Squash, Black Bean and Goat Cheese Tamales tonight, we found that it is actually a fun way to spend the afternoon/evening! To encase the batter and filling, you first need to soak dried cornhusks until they become soft and pliable. The recipe suggested 30 minutes, but I found they were still a little too firm - I let them go for about 1 1/2 hours and they were much easier to work with. They will want to float when you pour the hot water on them, so weigh the husks down with a plate and add a couple tomato cans on top or use a heavy pot. 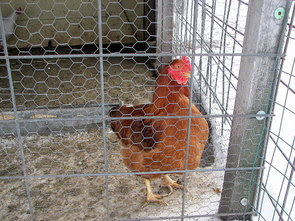 You will have softened more husks than you will use, so take your time and pick out the best looking unblemished ones. Some of the leftover husks will be cut into thin strips to use as ties that will hold the assembled tamales together. The batter/dough that surrounds the filling is a mixture of masa, water, ricotta, oil, baking powder, salt, grits and enough vegetable broth to get the right spreadable consistency (once it was combined, Jeff's first comment was that it smelled just like fresh tortillas!). 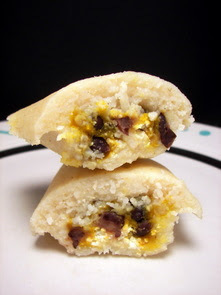 The filling is a mixture of pureed winter squash, black beans, green chiles and a bit of creamy goat cheese. You have a couple options for the squash - we made our own puree, but you could just as well use a canned squash or we have even seen it sold frozen in some markets. The filling procedure may seem a little complicated, but after you do your first one, you will see just how easy it is! To ensure the filling is not too runny, don't skimp on draining the squash, especially if you are using a frozen product. 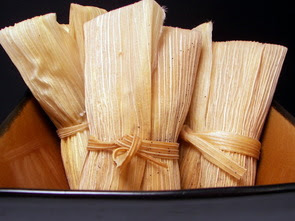 To cook the tamales, they are lined up like soldiers in a little basket inside of a large pot and left to steam for about 60 minutes. They should be done by then, but you can test one if needed - the corn batter should be firm and easily pull away from the wrapper. I'm certainly not one to say if these were authentic or not, but we both agreed that we very much enjoyed the results! The batter around the filling cooked up quite light and moist with a deep corn flavor - the filling was flavorful, creamy and we loved the tang from the goat cheese. What I particularly think that we liked the most was that you can change up the flavor quite easily! Leave the batter the same, but have some fun and mix up the fillings - use your favorite chunky salsa or shredded chicken and cheese or whatever sounds good to you! The recipe makes quite a bit, especially for just two of us, but we went ahead and made the full batch as these freeze very well and will be nice to re-heat for lunches! If you are so inclined, you could re-heat them by steaming again for the best results, but you could just as well toss them in the microwave (use medium power) until warm enough. It was one crazy weekend in our house! 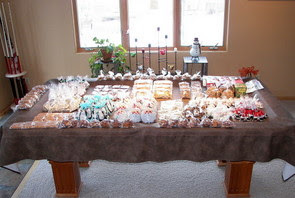 We finished up all of the baking, got everything packaged and the gifts were hand delivered (mostly to our great neighbors) or brought to the post office bright and early this morning - I think the total number of packages, including what Jeff delivered, was 21... certainly more than last year! We even added a few new and untried recipes to the list this year! Fair warning - this is a massive post! It may take a bit to download all of the pictures if you are on a slow connection. If there is a recipe for any of the treats, you will find them colored in blue and located directly underneath the picture. Now, shall we dive right in? 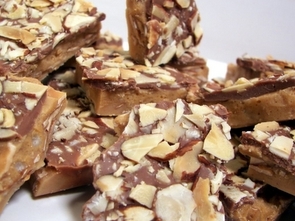 Starting us off is one of Jeff's all-time favorites - Almond Roca. We toyed with the recipe this year - occasionally we had issues with the butter separating during the cooking process in the past. By changing the sugar amount (slightly), reducing the water and adding a couple tablespoons of light corn syrup, I made around 7 perfect batches of this - no separating issues at all! 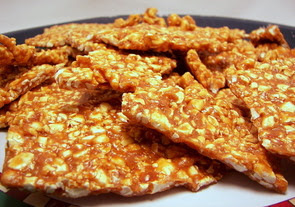 Crunchy, buttery, nutty and a rich layer of chocolate make this candy irresistable. 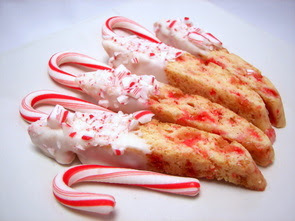 Here is one of the new recipes - Candy Cane Biscotti. This biscotti is crunchy, yet still somewhat tender as it has a butter-based dough. 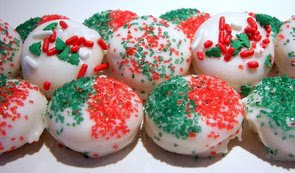 We dipped half the ends in melted white chocolate and sprinkled them with additional crushed candies. 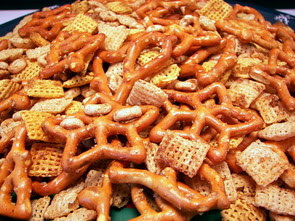 Buttery checkerboard pretzels are the base for these next treats. They are topped with a caramel laced rolo, placed in the oven to slightly soften the chocolate and adorned with a crunchy kissable candy. It wouldn't be right if we didn't make one of our favorite cookies. 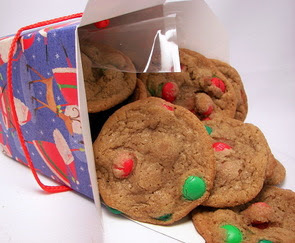 Using chocolate malt powder in the dough gives these a leg up over regular M&M cookies. 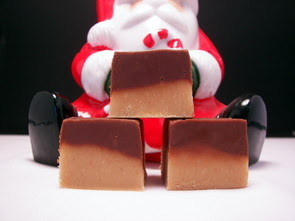 We always do two types of fudge and here is the first. Always a big hit and gets lots of comments! The pups felt a little left out during the past couple of years when we did this mega baking spree. 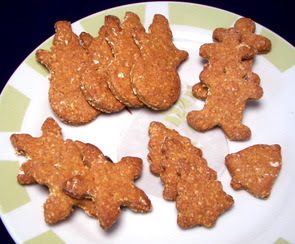 They decided we had to include a baggie of holiday-shaped biscuits to give away to the people who have doggies so they can feel the love too! While this next treat is not a new recipe to us, it is the first time we have made them to share with others. 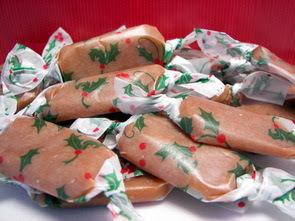 These caramels are so fantastic, yet so easy to make. Chewy and delicious. 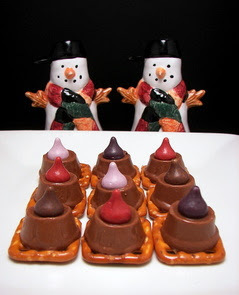 There is a picture of them unwrapped if you click on the link to the recipe. These cookies are new to us this year. Instead of decorating them all, we sent along a bag of homemade royal icing (no worries, we used meringue powder and not egg whites!) in a few of the boxes so they could have some fun and decorate the cookies themselves. 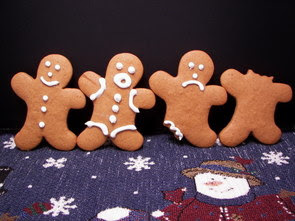 Hee hee... we did have a little fun while baking them - let's just say a few of the cookies lost a limb or their head(!) by the swift plunge of a scalloped cookie cutter. This was done by special request from Jeff - is he evil or what? So we did decorate a few cookies after all... see? 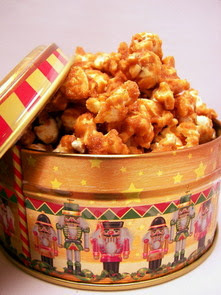 A caramel/toffee mixture that is heavily ginger-spiced is poured over popcorn and slowly baked in the oven to crisp up. This is so crazy good - it is one goodie that is hard to keep your hands out of! These spiked pecans are a new recipe to make the list this year - the nuts are first thoroughly coated in a combination of egg white and the coffee liquor. 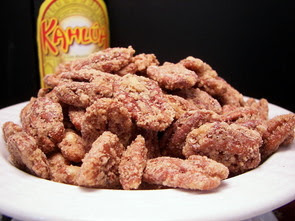 They are then tossed around with granulated sugar, cinnamon and salt, and then roasted until the nuts are golden and the coating is nice and crunchy. They don't have a boozy taste at all, just sweet with a very mild coffee/cinnamon spiced background - these fancy nuts would be an exquisite addition to any holiday party tray. 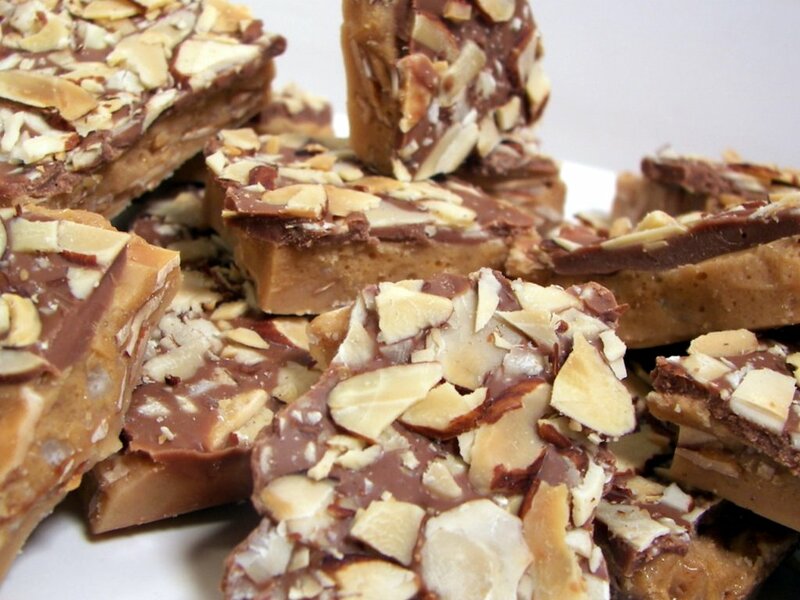 We have to make so many batches of this bark because it is just so good. 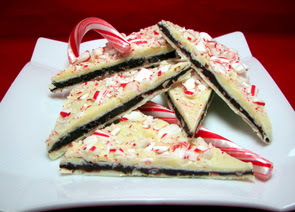 This has two layers of real white chocolate with a dark chocolate/cream mixture in the middle that is infused with peppermint. It also has two layers of crushed candy canes! 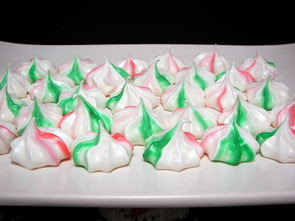 We do these crispy meringue bites often - the only thing I did differently this year was to add a green and red stripe to the pipping bag to create the effect you see! This next unusual treat is a great way to use up popcorn. Salty and sweet with a mild molasses hint lingering in each bite. We always make this snack mix to have around - this is quite spicy, so feel free to reduce the cayenne if you like. We thought we should include another cookie to the mix (or we may just be crazy), so we did one of our new favorite gingersnaps! These store quite well and have a pleasant spicy (but not hot) bite. 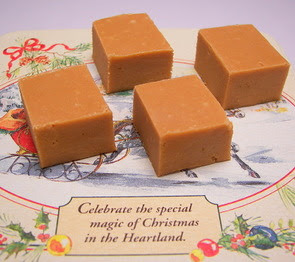 Smooth, creamy and rich - the only words that can describe this additive fudge! And finally, another recipe that is a must for every year. One-bite salty and sweet treats - these are small Ritz Bits crackers, filled with peanut butter, dipped into real white chocolate and finished off with a variety of holiday sprinkles. Here is a snap of some of the gifts before we packed them up in their boxes - this is probably just over half of what we did - the rest are scattered anywhere there was a free space! A few days ago, I made some cookies to put in the freezer so we would have something to munch on while we were finishing up the gift baking this weekend. 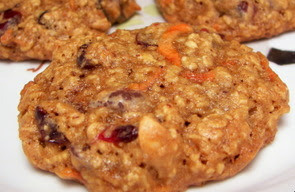 This was a good idea as it is helping keep us out of the piles of goodies laying around - it also gets bonus points for being a pretty healthy cookie! While we normally groove on cookies that are more crispy, these homely Super Cookies have a bendable softness to them, yet they are not spongy or "cake-like" either. 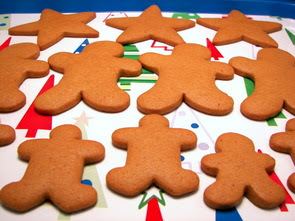 These spicy little guys attain a lot of their snazzy flavor from cinnamon, ginger and cloves added to the dough. 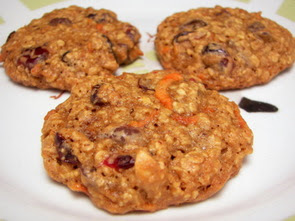 With an interesting combination of shredded carrots, chewy dried cranberries, dark bittersweet chocolate, toasted slivered almonds, oats and white whole-wheat flour, the cookies bring lots of good nutrition in each bite. When you bake them, you want the centers to be just barely set - the cookies will finish cooking as they cool on the baking sheet. Don't be tempted to try and remove them from the sheet too early as they are quite soft while warm and may break apart. Now, with all these healthy ingredients, do they have that "healthy" taste to them? Well, yes and no. They do have a slight wheat-y taste to them and since the fat used in the cookie is canola oil, they do not have a "buttery" flavor that most oatmeal-type cookies have. Having said that, between the chunky pieces of chocolate, sweet/tart cranberries, crunchy almonds and fragrant spices, there is plenty going on in the cookie that distracts from those good-for-you aspects and makes the cookie seem more like a tasty treat. The flavor kind of reminded us of a loaded spice cake, minus the frosting of course, with a soft, moist and chewy texture. If you don't have white whole-wheat flour, go ahead and use all-purpose - but we both thought it worked quite well with this cookie. He wanted spicy... could I deliver?